Island is covered by dense jungle because still unexplored. Around koh rong samloem there are other small islands and you can go by boat, also you can do some snorkeling and fishing! 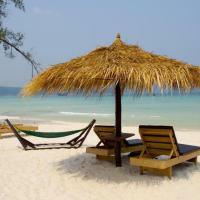 Trip to Koh Rong Samloem takes 2 or more hours from SihanoukVille, Cambodia. There are also speed boats that takes a half hour however. Also written Koh Rong Samlon and Koh Rong Sanloem. The strange exceptions of the peace of this island is the Full Moon Parties in Saracen Bay that bring many people for the night and special Christmas and New Year parties!! 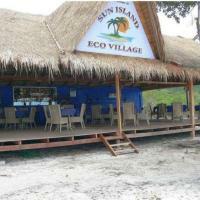 !Find bungalows, resort, guest house, rooms, accommodation koh rong samloem below. 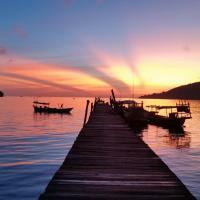 Check the complete Koh Rong Samloem Travel Guide with all informations about! Situated in M’Pay Bay Village on Koh Rong Samloem, Sunset Bungalows offers tranquil and comfortable accommodation with panoramic views of the sea. Surrounded by lush greenery, it features an in-house restaurant and bar. Fitted with wooden flooring and thatched roof, fan-cooled bungalows come with a clothes rack, mosquito net and a balcony with seating area. 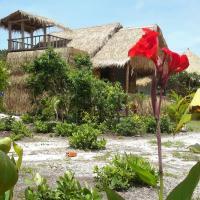 Bungalows include a private bathroom with towels and shower facility. 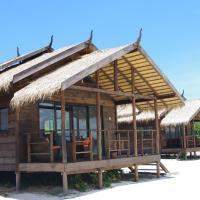 At Sunset Bungalows, guests may enjoy activities such as fishing, diving and snorkelling on site. Fluently-conversed in French and English, the friendly staff can assist with laundry, ticketing service and shuttle arrangements. The property is about 21.3 km from Victory Beach and 21.7 km from Independence Beach. Sihanoukville International Airport is approximately 37 km away. 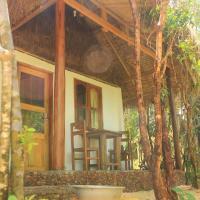 Bong Kun Guest House is set in Koh Rong Sanloem, 24 km from Sihanoukville. Guests can enjoy the on-site restaurant. Some units feature a seating area for your convenience. You will find a 24-hour front desk at the property. 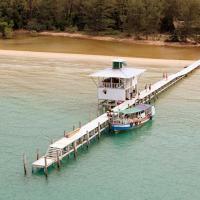 Song Saa Private Island is 21 km from Bong Kun Guest House, while Koh Rong Island is 17 km from the property. 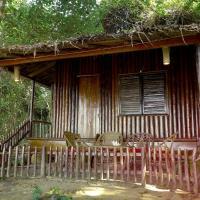 Sandy Beach Bungalows is a quiet beachfront property situated on the island of Koh Rong Samloem, 20 km from Sihanoukville. The resort has a private beach area and water sports facilities. Guests can tuck in to a meal at the in-house restaurant and enjoy a drink at the bar. On rare occasions when the weather is not permissible due to strong waves, it is a 20-minute walk through a section of jungle to the property or a short walk in the water from the boat during low tide. All fan-cooled rooms open up to views of the sea while some units offer a private balcony. Fans in units come with nightlights and are rechargeable. Guests can make use of the electric socket provided in each bungalow between 18:00 to 22:00 specially for mobile devices. Some units come with private bathrooms, while all bathrooms provide shower facilities and towels. Hot showers and air conditioning are available at an extra charge. Guests can approach the staff at Sandy Beach Bungalows to arrange for fishing trips and tours as well as rental of snorkelling equipment and boat hires. There is ticket service at the property. Charging station for mobile devices are available at the in-house restaurant. A number of activities are offered in the area, such as snorkeling, fishing and diving. 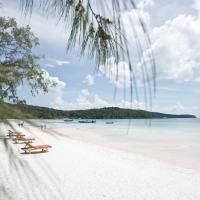 Song Saa Private Island is 21 km from Sandy Beach Bungalows, while Koh Rong Island is 17 km from the property. Boat transfers are available to the property at an additional charge.